It's been a long time since I read something that demanded answering in detail. I just read, Piketty shrugged: How the French economist dashed libertarians’ Ayn Randian fantasies. The first thing that stood out was that despite referring frequently to Ayn Rand's Atlas Shrugged, it's obvious he never read the book. It's also clear he doesn't understand libertarians. To understand the libertarian view of inequality, let’s turn to Milton Friedman, one of America’s most famous and influential makers of free market mythology. Friedman decreed that economic policy should focus on freedom, and not equality. Right off I have to address the fact he called the free market a mythology. Friedman and libertarians believe the focus is on liberty as well as freedom. Also freedom doesn't mean you get to harm your neighbor. The progressive's focus on equality is a waste of time because it's unachievable. No matter how hard government tries it can never make us equal. The best government can do is give us equal opportunity to be the best we can and treat us equally under the law. Basically, the lessons boiled down to this: Some degree of inequality is both unavoidable and desirable in a free market, and income inequality in the U.S. isn’t very pronounced, anyway. Libertarians starting with these ideas tend to reject any government intervention meant to decrease inequality, claiming that such plans make people lazy and that they don’t work, anyway. Things like progressive income taxes, minimum wage laws and social safety nets make most libertarians very unhappy. The things that makes libertarians unhappy are government programs that waste money that could be used to help the people about whom they seem so worried. The progressive tax they seem to embrace too often help the rich. Under the current progressive tax system we find millionaires paying no taxes or a very low percentage while poor people still pay into the wasteful system. Their progressive tax system will allow companies like General Electric to come out with a net gain, while people like myself pay. As for the problems with minimum wages, I addressed those in, Why Minimum Wage Laws Are Bad. Welfare can be a good thing, but as I often say, all things in moderation. I have to ask only one question – why work when you don't have to? Permanent welfare removes the incentive to work. I will never forget something from the 60's. Gov. George Wallace's maid had a sister living in Baltimore. The sister told the maid that she should move to Baltimore because there she could make more on welfare than working for the governor – she moved. How did libertarians get it all so backwards? Well, as Piketty points out, people like Milton Friedman were writing at a time when inequality was indeed less pronounced in the U.S. than it had been in previous eras. But they mistook this happy state of affairs as the magic of capitalism. Actually, it wasn’t the magic of capitalism that reduced inequality during a brief, halcyon period after the New Deal and WWII. What Parramore doesn't understand is it's government policies that currently causes money to pool at the top. Because of burdensome regulations and high tax liabilities companies became afraid to invest and expand. In a free flowing economy businesses are continuously expanding and hiring new workers. New businesses are started because others want to get in on the boon. Successful businesses and people all have something in common – they tend to be very competitive. The last thing they want is to sit on their money and become stagnant. They are happiest when expanding and challenging themselves. The short lived Occupy movement made the 99% become a household term. This is to imply that the 1% wealthy control most of the money and keep it greedily for themselves. It gives the impression of Uncle Scrooge from Donald Duck. The top 1% pay 40% of the taxes, while the top 10% will pay 71% of all taxes. The above statement also implies there is a defined number of dollars., which is simply not true. Because of trade, Quantitative Easing, as well as other means, the amount of US dollars is not constant. Progressives cling to the Great Depression as their greatest achievement – one of the worst economic times in the history of this country. I am sure the economic gap closed because more people were living in poverty. The gap closed, not because the poor earned more, but everyone's income decreased. Progressives try to claim the economic boon of the 50's as their own – a period when the middle class rose to prominence. Economist like Friedman will tell you that at the end of WWII taxes dropped dramatically. Even the Democratic legend President John F. Kennedy believed in lowering taxes to allow for the best economy possible. Also because the war had sapped the country of many things people needed to live day to day, this caused an increase in manufacturing, which meant more jobs. As you’ll recall, if you watched the movie Titanic, the U.S. had a class of rentiers (rich people who live off property and investments) in the early part of the 20th century who hailed from places like Boston, New York and Philadelphia. They were just as nasty and rapacious as their European counterparts, only there weren’t quite so many of them and their wealth was not quite as concentrated (the Southern rentiers had been wiped out by the Civil War). After the Great Depression, inequality decreased in America, as New Deal investment and education programs, government intervention in wages, the rise of unions, and other factors worked to give many more people a chance for success. Inequality reached its lowest ebb between 1950 and 1980. If you were looking at the U.S. during that time, it seemed like a pretty egalitarian place to be (though blacks, Hispanics, and many women would disagree). Parramore proves himself that appearances can be deceiving. He declares that progressive policies brought about economic equality, while saying a huge segment didn't share in this so-called egalitarianism. I remember while living through government Jim Crow laws how many blacks were delegated to low paid menial task. This was in part because many didn't have the opportunity for even basic education. I'd suggest Parramore stay silent if he can only boast how great things were for white males. By excluding a large segment of the population he can embrace the faux egalitarianism. He talks about the importance of unions in his so-called egalitarian period. Unions were a great economic boon for the south in the 70's as manufacturers began to flee to the union free south. Unions and progressive policies have devastated cities like Detroit. In places like Detroit you will find economic inequality at its greatest. Parramore really showed how little knowledge he had of Atlas Shrugged. The ironic twist is this: The reason a person like the fictional John Galt would be able to rise from humble beginnings in the 1950s is because the Gilded Age rentiers lost large chunks of their wealth through the shocks the Great Depression and the deliberate government policies that came in its wake, thus loosening their stranglehold on the economy and society. Galt is able to make his fortune precisely because he lives in a society that isn’t dominated by extreme concentrated wealth and dynasties. In the novel Atlas Shrugged, John Galt was an auto worker and had no appreciable wealth. He describes Galt as some rich corporate socialite, when in fact he was the very opposite. He was middle class and as he saw what the progressives were doing to the world he loved so much, which was sending it speedng into a depression. While the rich progressive socialites destroyed the economy, he ran away. He moved to the mountains of Colorado where he waited for the world to collapse. It was there that he began building an objective society. Objectivism isn't always the same as libertarianism, but they are very similar. Yet the logical outcome of an economy in which there is no attempt made to limit the size of fortunes and promote greater equality is a place in which the most likely way John Galt can make a fortune is to marry an heiress. So it was in the Gilded Age. So it may be very soon in America. Galt did become enthralled with Dagny Taggart, CEO of a train company started by her father. She only met Galt after she went in search of him. She wasn't the type to give up and had hopes of convincing Galt to help in saving the country. Anyone who would refer to her as a socialite doesn't know the character. Rand also wrote in the book how progressive leaders were placing strict limits on corporations. They created the Fair Share Law in an effort to equalize incomes and ownership of property. Actually, there is a very big difference. It is the particular rules governing society that determine who amasses a fortune and what part of that fortune is passed on to heirs. The wrong-headed policies promoted by libertarians and their ilk, who hate any form of tax on the rich, such as inheritance taxes, have ensured that big fortunes in America are getting bigger, and they will play a much more prominent role in the direction of our society and economy if we continue on the present path. Progressives believe that any wealth amassed during a life time should be given to the government so that it can be divided among the population. 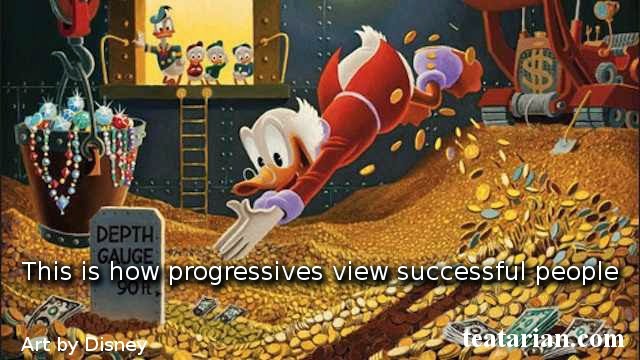 Until they can achieve their progressive Utopia they are content with Death Taxes. These are the same taxes that are driving family farms out of existence because the land is valuable even if the owners live modestly. As I wrote in Warren Buffet and the Death Tax, the super wealthy find ways around progressive estate taxes. He also portrays libertarians as greedy. Those like him just don't believe people should be able to keep and share with family the things for which they have worked and given their, blood, sweat, and tears. The wealthy are always the largest contributors to charities. They provide jobs so that people can feed and clothe their families. Ask a progressive to name any country in history that has had a long term existence with progressive governments. Two of these countries come quickly to mind, North Korea and Cuba. Are those the worlds in which you want to live? I'll bet almost no one would trade current day America for either of those countries. Some might ask why I went to the effort of replying to this man's article. This is one of the best examples I've seen of the progressive mind. There are many like him teaching our children and leading them down the mythical road to a progressive Utopia. Parramore also has the advantage of access to a nationally popular website. His writing will likely reach millions, while mine far less. In this case he holds the position of power and advantage for which he seems to hold such disdain. Those who think they need an advantage to achieve wealth aren't willing to put in the work to gain that wealth. Sometimes the progressive wealthy like to pretend they are one of the disadvantaged. No matter the case, these people are dangerous because they twist facts to make a lump of coal look like a diamond. The reason they find it so easy to attract believers in the progressive Utopia is because they see the crony capitalist system of today as the free market. If we have ever had a completely free-market system it was more than 150 years ago. Since the 1800's governments have been trying to manipulate the economic system. I beg people to go learn true economics and then make sure they teach it to their children—You cannot trust schools to teach economic facts. I know Atlas Shrugged is a hard book to read, but again I beg you to read it along with your family. Even if Ayn Rand's Objectivism belief isn't for you, the world in which she wrote is very real. No one is more qualified to write about progressives or communism than someone who has lived in a country where it was the government du jour. Never forget that the best way to help the poor is with a job and a strong economy. This doesn't mean you can't work with your community leaders to help people who stumble along the way. The farther that help moves away from your community – such as the federal government – the more will be wasted on government bureaucracy.